Note that a recipe becomes visible ONLY when you unlock that in the Thaumonomicon. The mod is ClientSide Only, so you don't have to install it on the server to get it working. You have my permission to include "Thaumcraft NEI Plugin" in any modpack, public or private, provided that credit is given, the source files are not modified and the overall mod pack is distributed free of charge. 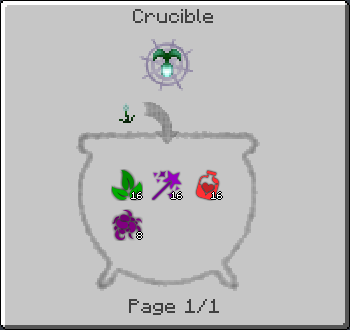 NEI doesn't show the rotten flesh to magic tallow crucible recipe, despite it is unlocked in the Thaumonomicon. Is it intentional? 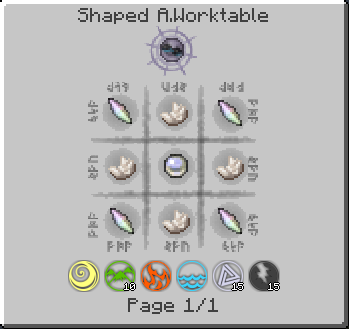 I can see arcane worktable recipes though. Great mod, but I've been having a severe framerate lag problem when using the item lookup. I use another mod "Thaumcraft Minus Thaumcraft" to get most items scanned already, so when it goes to display items with given aspects it shows a /lot/, like a couple pages worth that have to be scrolled to see. It however seems like the more items it displays the more laggy it becomes until it's hard to use, the lag goes away immediately when I close the window or switch to another recipe tab, and comes back immediately when I reopen it. During debugging I wiped my scanned objects with an NBT editor and started re-scanning stuff. For a while it was working perfectly, but then after a while it started lagging again. I'm wondering if it's an issue with the number of objects scanned. I only scanned the blocks tab and the thaumcraft tab of the creative inventory with "Thaumcraft Inventory Scanning" mod, and it was still lagging. I'm wondering if there's a resource leak or some sort of loop, maybe something to do with the fancy show all the objects in a circle thing. I have no idea. Pretty cool, but having it client-side seems a little too much. It should not be client side because you'd need this to join any server with it. Is this compatible with the latest Thaumcraft or is there an update on the way? Now NEI is a Thaumanamacon. Yaaaaaaayyyy.....! It is like you did the thaumanomicon as a seperate mod! Very Cheaty! Glad someone finally made this, using a wiki every five minutes when i want to remember how to craft a golem or magic item got old fast, all i can say is you might want to improve the look of the GUI a bit. Other than that good job. While your plugin helped a little I was still pretty much lost with using this with Thaumcraft. I still can't find recipies for the stuff that is needed like the book that tells me what to make to get started. For the record I never played Thaumcraft before. Once you have your Thaumonomicon ready you won't need anything else. 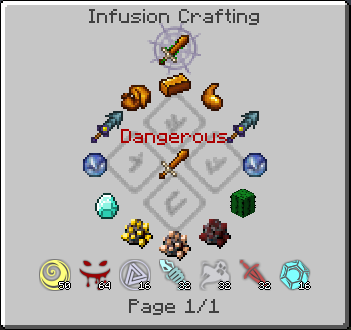 My Plugin is thought to speed up the crafting process because when you have to craft, for example, 10 different golems with different cores looking every time in the Thaumonomicon could become annoying. I have sent you a Private Message about getting permission from you to include it in my 3rd Party FTB Mod pack. Can i have permission to include it? Please reply here or to the PM.